Sending your files to BML Print is very easy. Its can be simply uploaded once a product is added to your basket. We accept large files up to 2GB in size using many methods (depending on the upload capacity of your internet connection). To reduce file sizes we recommend compressing your files into a zip file before uploading. 2.) larger files we recommend using our file transfer accounts. The most common mistake in supplying artwork is missing off the bleed area. Its not difficult and can save you valuable time. Please ensure that all colours and embedded images are saved using a CMYK colour profile. While RGB images look good on your screen, they will alter significantly when printed out at CMYK, make sure to design and look at your design in CMYK colours before sending it to print. This way you get no surprise’s only top quality print from us. the colour matching is 100% correct and just like the colour of the hard copy that has been supplied. Please always supply us with fonts used in your documents, specially if its something special or custom that you have obtained. We have an extensive font collection, but ask all supplied artwork text is converted to outlines. We want to guarantee that when opening our document nothing changes placement or changes remotely. To outline fonts in Adobe Illustrator, select all the elements in your document: Select -> All and then to outline the fonts: Type -> Create Outlines. Supplied images must be at least 300dpi and saved as CMYK in order for us to print to the highest level. Remember image sources on the internet tend to be 72dpi and RGB which are too low in resolution for printing. Re-sampling an image from 72dpi to 300dpi will not solve the problem and still not be print quality. We understand at Manchester Printers that its not always possible to deliver 300dpi high resoultion images, but ask you understand that we can not make the images better on production and we can only work with the images you supply us. 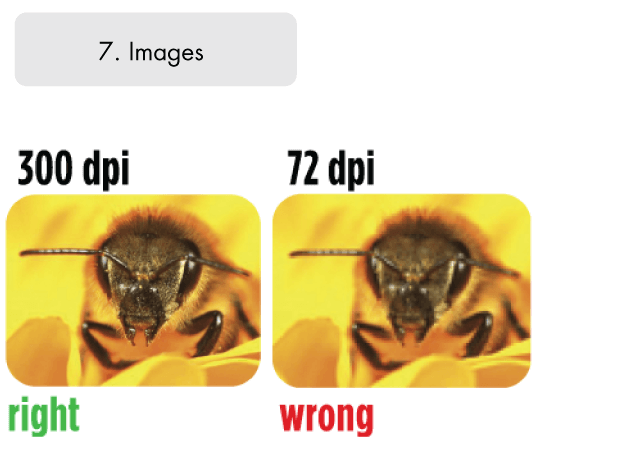 See image below to see the difference between a 300dpi image and a low resolution 72dpi image. We supply each client with low resolution digital proofs in pdf format, as well as High resolution digital proofs available on request for every job we process.